The Hagia Sofia which for a thousand years the largest cathedral in the world is famous for its dome and the magnificent mosaics which were completed after the church was dedicated. The dome was damaged by several earthquakes and fires which required extensive restorations. 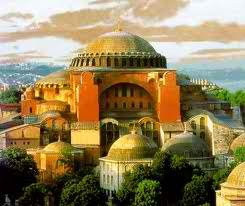 Materials were brought from all over the Byzantine empire. 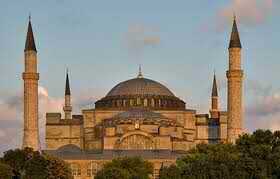 Prior to 1453, the Hagia Sophia served as the Greek Patriarchal cathedral of Constantinople (the old name for Istanbul) or a Roman Catholic Cathedral (from 1204 – 1261). When Constantinople was conquered by the Ottoman Turks in 1453, the building was desecrated and Sultan Mehmed II ordered the church converted into a mosque. The mosaics were plastered over and the bells, altar, iconostasis, and sacrificial vessels were removed and with replaced with Islamic items. Over the centuries, the Sultans maintained the structure and constructed to the exterior and interior architecture and decoration. In 1935, it was converted to a museum by the founder and first president of the Republic of Turkey, Mustafa Kemal Ataturk. Extensive renovations continue as the building is assaulted by water from above (roof leaks) and below (ground water incursion) and general age.